Perfect Prep Poreless Primer in Glow... I believe this is the only travel-sized product in this kit. I love how smoothly it goes on! It feels like a light air-whipped mousse, and you get a super smooth feel... allowing the rest of your makeup to go on very evenly. It looks peachy in the container, and any glow that it provides is super subtle- nothing overly shimmery. Visible Skin Bronzing Powder... The one choice you have to make with this kit is whether you want the "lighter" or "deeper" bronzer. I chose the deeper, because I feel like I have plenty of lighter bronzers, and as I use my sunless tanners and my skin deepens, I thought it'd be nice to have a darker bronzer. I gotta say, this is the darkest bronzer I've ever seen! But it still works for my medium skintone when you use a large brush with it. I could see this being perfect for already very tan skintones who can't ever find a bronzer dark enough. If you also have my skintone and choose deeper- just be careful with your application & keep it light. Since it's matte, it can be a great contour! Effortless Airbrush Blush & Highlight... This product really caught my eye in the QVC presentation, and the photo at the top doesn't do it justice. Both colors in this duo look practically metallic- and you are supposed to use the double ended blush to apply it. Mally advises you to use the lighter end of the brush to apply the highlighter first, then the dark brush to apply the blush. I kind of like that strategy- it keeps the highlight from looking too harsh. This is a very subtle highlight, but I found the blush to be quite pigmented & a beautiful coral-pink shade. Evercolor Endless Eyeshadow in Sunglow... This is one of my favorite parts of this kit! It's a 2-part eyeshadow PLUS applicators for both parts as well! On one end you have your cream shadow- which is a GORGEOUS bronze that goes on super smooth. The other side is basically a loose pigment that really gives the look some shine and this lasted me ALL DAY without creasing. Best of all, you can get by with just these 2 steps because it looks great all over the lid AND into the crease. This is a brand new product from Mally & I'm really impressed! Automatic Starlight Waterproof Eyeliner in Black Navy... I've been nuts about these automatic liners from Mally since I first tried one. 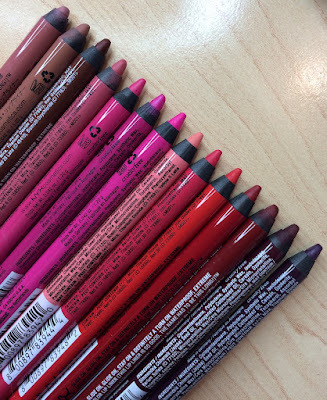 They are probably the longest wearing liner for the waterline and they're great on the lashline, too. This Black Navy shade looks surprisingly awesome with the bronze shadow, plus it makes the whites of your eyes pop. So far, I haven't seen these automatic waterproof liners available without getting one in a kit! They are truly phenomenal. Volumizing Mascara... 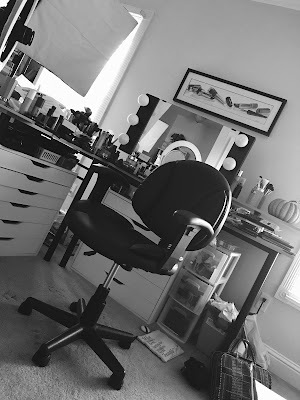 I already had a tube of the Volumizing mascara & knew I loved it!! My mom has some of this mascara as well & she also thinks it's great! I love 2 things about it: the formula isn't too wet, and the brush is super thick with bristles- it allows the brush to grab the individual lashes & plump them up! The color is super rich & black also. I can also apply this to my lower lashes without flaking! High Shine Liquid Lipstick in Just Heaven... This sheer peach color is pretty, but it's not my favorite Mally liquid lipstick. While I enjoy the formula, this particular shade is quite sheer- In my pictures I'm actually wearing a medium pink colored liner underneath to give some more pigmentation. Zippered makeup clutch... Couldn't leave this out! I was impressed with the size of this bag, and the fact that the outer panels have a plastic coating on them, so if it gets dirty, you just wipe it off! There are little pockets inside to hold smaller products. What I love about this kit from a reviewer's perspective is that what you see on my face is basically what you get! Other than these products- I have on Aveeno Positively Radiant Tinted Moisturizer, Revlon PhotoReady Concealer, and Ardell Wispies false eyelashes- that's it! Overall, my favorite products in this kit are the primer and the eye products- especially that new Evercolor Eyeshadow and the Waterproof eyeliner. I love the way the bronze and blue tones make my eyes pop. The bronzer + the blush/highlight are a great cocktail for creating cheekbones, too! Hopefully this post gives you an idea of what Mally's Just Heaven kit will do! My Cry-Proof Eye Tutorial is now posted on the Bridal Guide website! It's part 2 in my exclusive series! 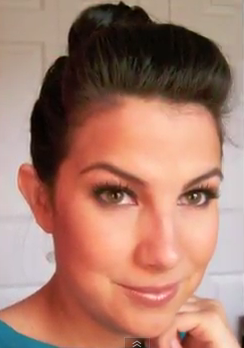 :) Look for more bridal beauty videos on the BG site Mondays in May. The sun is out today! woohoo!! I've started keeping my daily to-do list in little planner & I find I'm feeling less stressed. The word "literally" is really over-used. Picked up some groceries this afternoon... most exciting item: Banana Cream light yogurt! Was anyone watching QVC last night? Kim Kardashian was on selling K-Dash stuff- loved the blazers & maxi dresses! I'm not a fan of most of Mally's cosmetics either. The primer is very drying on my already dry skin. I also find her lip glosses to be sticky and I don't care for the click pen. I do like her eyeliners, however - they are great! I watched a little of the K-Dash show last night and I thought Kim was very knowledgeable and down to earth. Loved the handbag but it was a bit out of my price range. I'm a Mally fan, and thought this was one of her best kits to date. Emily, the highlighter also works brushed over eye shadow or simply primer. It gives a nice but low-key glowy look. I LOVED this kit - but I think it does work better on certain skin/hair types. I am also medium/tan skin with dark brown hair and I feel like this kit was made for me. I purchased this kit as well as the cancellation concealed kit and it's my first mally beauty purchase and so far I love them!! Could you do a tutorial on your look so we can see how you used the products? It's almost impossible to get Mally products in the Netherlands. Fortunately I have family living in Arizona, so I got some Mally mascara from them and love it. I think this looks lovely on you!! Love the look! Waiting on my kit. I love this kit, too. I got the lightest bronzer and it's pretty darn dark. I'm not sure that I'll use it that much, but I do like it. The eye product is my favorite part of this kit. Love the color and the staying power. I wasn't crazy about the liquid lipstick at first, but then I put a little Geller lip spackle on my lips before using the product and got more color payoff. I'll probably use liner under it most of the time. Love Mally! Did you get an Allure Beauty Box ordered yesterday? Can't wait to get mine and to hear what you have to say about it, if you ordered it. Thanks for all of your tips and tricks! Hi! i've always watched your tutorial coz i really love them! Love the way you prepare your eyebrows! I hope to see you in my blog! I purchased this kit and love it! I'm always leary of these sets. I ordered a Mally TSV a while ago and it was eh. Everything in the kit works for. I'm glad I opted for auto delivery. Can't wait to see the colors in the other sets. I'm thinking about getting some Mally products. I really love this look. Your skin is glowing! Can you do a tutorial? I've been watching Mally quite a lot on QVC (dont think she's on here in the UK nearly as often as she is in the US) and although she's stunningly beautiful and a great saleswoman I havent been persuaded to buy a any products cos I hadn't come across many indepth reviews! love this look BTW ur so Pretty ! First of all, I want to say that you are a very beautiful blogger. Thank you for hundreds of variations of makeup, hairstyles and just reasons for a good mood. I love your evening make-up. I would also like to write such creative reviews in my online paper to write on blog as you do. It seems to me that you have huge cupboards filled with cosmetics. This is the dream of any girl!